English: Swallow wing; French: Barbacou a croupion blanc; German: Schwalben-faulvogel; Spanish: Buco Golondrina. 5.5-5.9 in (14-15 cm); 1.1-1.5 oz (30-41.5 g). Quite small with relatively pointed wings. 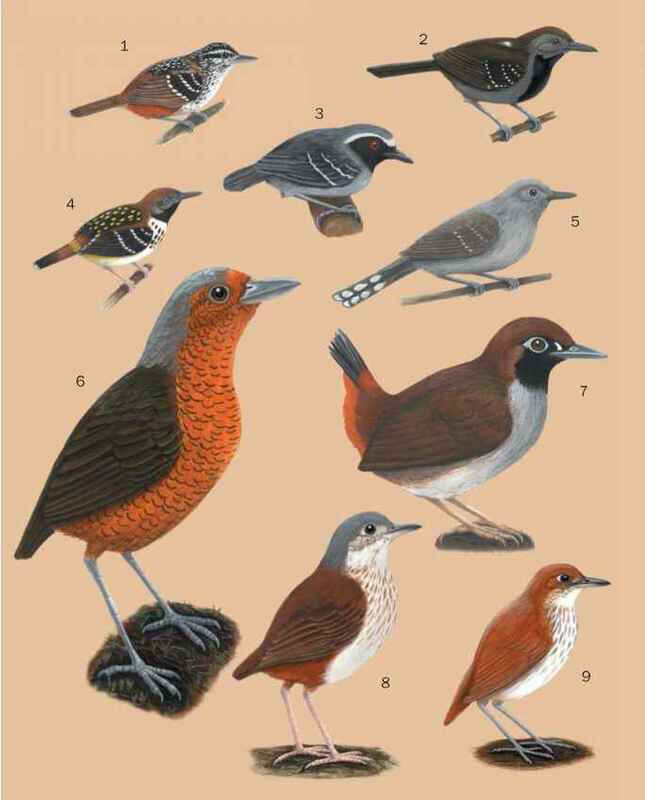 Mostly sooty black, with large white area on lower back, and chestnut on lower underparts. Bill short and black. 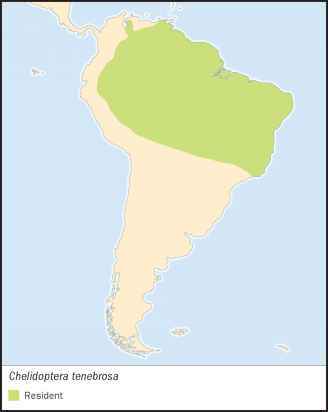 C. t. pallida: northwest Venezuela; C. t. tenebrosa: Venezuela (except northwest), eastern Colombia and the Guianas south to eastern Ecuador, eastern Peru, Amazonian Brazil, and northern Bolivia; C. t. brasiliensis: coastal southeastern Brazil. Recorded in wide variety of mostly open habitats 0-5,740 ft [0-1,750 m]), but prefers open sandy areas with scattered trees and bushes near forest. Spends most time in pairs or small groups, perched high up in bare branches of emergent trees or other vantage points, from which it flies to catch prey. It can stay aloft for prolonged periods, leisurely circling, stalling, then swooping after passing prey before gliding to a perch. In flight it vaguely resembles a martin (Hirundinidae) or, more closely, a wood swallow (Artamidae). Diet is entirely composed of bees, wasps, flying ants (Hy-menoptera), alate termites (Isoptera), and other insects caught and consumed in flight. One to two eggs laid in cavity at end of burrow dug into level sand or earth banks, frequently beside rivers. Incubation and nestling periods undocumented. Not threatened. Common and conspicuous throughout much of range, and favored by moderate deforestation.